Corry Micronics offers a line of cavity filters. We have several stock cavity filters that are designed for specific industries. Some of the more popular stock units are for filtering CDMA repeaters with a Bandpass range of 825 to 835 MHz and other units designed to Bandpass a range of frequencies from 870 MHz to 880 MHz. Two other popular frequency bands are the 3G and SCDMA bands. These cavity filters are designed to pass frequencies from 2010 MHz to 2025 MHz and to pass 1920 MHz to 1980 MHz. 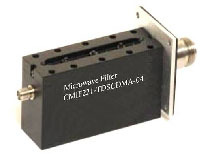 At Corry Micronics we have also designed filters for the WCDMA frequency band. These filters have a pass band of 1920 MHz to 1980 MHz and 2110 MHz to 2170 MHz. We have several standard filters designed for the GSM band. These filters have a pass band of 825 MHz to 880 MHz and 909 MHz to 960 MHz. Corry Micronics will also custom design cavity filters to your requirements.